Writing a food blog is not good for the waistline…crunchy potatoes, ice cream, creme caramel, cheesecakes, lasagna…well you get the idea. So I’ve been back at the gym recently, exercising so I can continue to eat without the inevitable consequences. While I do like to eat healthy food, it has to be healthy food that is delicious and doesn’t feel like hard work either cooking or eating it. As part of the meal I ate at Maha a while back there were a couple of substantial grain salads, both of which I really enjoyed. When I think of making a salad I’m often stuck in a bit of a rut, usually thinking of it as a side salad and put together something involving lettuce. While these green salads are great, I sometimes forget how satisfying and infinitely variable a grain based salad can be. They are perfect for summer because they keep well in the fridge, are there ready and waiting for you when it is too hot to cook, but they also work well in colder weather too because they are so substantial. So I have been experimenting with some grain based salads and I have a favourite one of the moment. It is inspired by the lentils and freekeh at Maha. It is really nothing like that one except the grain and lentil. Mine is a combination of freekeh, small green french type puy lentils with a dressing of pomegranate molasses, lemon juice, fresh coriander and preserved lemon. It then serves as a base to add other things. I’ve been eating this with some hummus, roasted peppers and the last of the cucumbers and tomatoes from the garden. One of the things I love about having a basic grain or pilaf ready to go in the fridge is that it can be dressed up to be a meal in a bowl with just the addition of some veggies, cooked and raw, maybe some protein if the grain base didn’t already contain some and a dollop or two of a favourite dip or dressing. I try to have a batch of undressed, cooked rice or quinoa in the fridge to do this with so I can have a meal ready in 10 minutes. 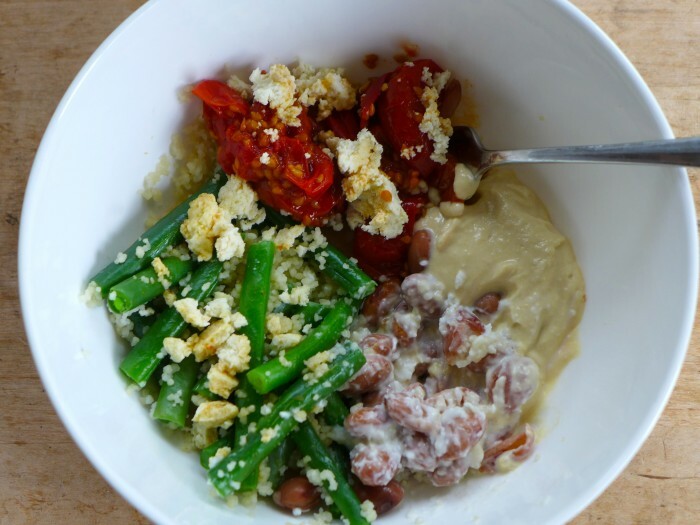 And even if you don’t, you can always rely on couscous which will cook while you prep the other stuff. Depending on what you put with it, the meal can go in any direction. Add some canned beans, tomatoes, avocado, corn kernels, tajin, lime and fresh coriander and it can be Mexican. Add some fried tofu, crushed peanuts, spring onions, fresh coriander and vietnamese mint, some wilted greens in sesame oil, soy and chilli and it can be SE-Asian. Take away the peanuts, mint and coriander, substitute Japanese soy, add some ginger and a shake of that wonderful Japanese sesame/salt flavouring gomashio it suddenly feels Japanese. Try some tofu fetta, tomatoes, cucumbers, olives, roasted peppers and hummus and it is heading off to the Meditteranean. The trick is to have the grain ready to go. That way it won’t take long and you’ll resist the temptation to get some crappy takeaway that will just be awful anyway. Just let your imagination run riot. 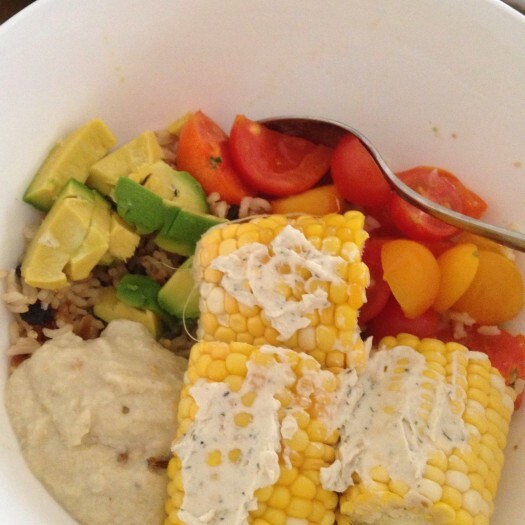 I’m loving my grain bowl meals at the moment. Here are a few I’ve eaten in the last week…the rice pilaf had some dried mushrooms, caramelised onions and a bit of wild rice in with the jasmine rice. The freekeh and lentils had the pomegranate molasses, lemon, coriander treatment. Apologies for some of the photos they are a bit ordinary, taken with the phone due to a flat camera battery. 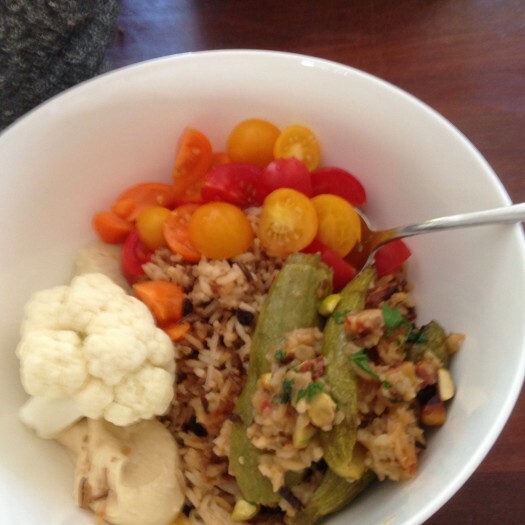 A vaguely middle eastern rice bowl…with tomatoes, stuffed zucchini, cauliflower, eggplant dip, pistachios and hummus. I also made a freekeh and lentil bowl with Middle Eastern flavours…fried cauliflower, hummus, eggplant dip, tomatoes and some carrots and quarters of baby cos lettuce for crunch, but forgot to photograph it. Thank you for this post I’m inspired for ready, delicious meals after late night classes. Glad to be of help Carla! I’ve really enjoyed making these over the last week or two. None of them has felt “healthy” or worthy in any way. Just delicious. I love these kind of salads with grains! So easy and delicious if you pre-cook the grains. I often cook brown rice and lentils together and have them ready to turn into a salad with whatever fresh stuff I have in the fridge. Your combos look delicious!